This article is about the film from 2002. For the 2008 short film, see Signs (2008 film). Signs is a 2002 American science fiction horror film written and directed by M. Night Shyamalan and executive produced by Shyamalan, Frank Marshall, Kathleen Kennedy and Sam Mercer. A joint collective effort to commit to the film's production was made by Blinding Edge Pictures and The Kennedy/Marshall Company. It was commercially distributed by Touchstone Pictures theatrically, and by Touchstone Home Entertainment in home media format. Its story focuses on a former Episcopal priest named Graham Hess, played by Mel Gibson, who discovers a series of crop circles in his cornfield. Hess slowly discovers that the phenomenon is a result of extraterrestrial life. It also stars Joaquin Phoenix, Rory Culkin, and Abigail Breslin. Signs explores the themes of faith, kinship, and extraterrestrials. Following its premiere in theatres nationwide on August 2, 2002, the film grossed $227,966,634 in domestic ticket receipts screening at 3,453 theatres during its widest release. It earned an additional $180,281,283 in business through international release, to top out at a combined $408,247,917 in gross revenue. The film was nominated for multiple awards, including those from the Online Film Critics Society and the Empire Awards. The film also won an award from the American Society of Composers, Authors and Publishers. Considering its $72 million budget costs, the film was considered a strong financial success after its theatrical run, and was met with positive reviews from critics, with some praising its atmosphere and story but others criticizing aspects of the script. The high-definition Blu-ray Disc edition of the film featuring the director's audio commentary, the making of the film, and deleted scenes was released in the United States on June 3, 2008. The original motion picture soundtrack, which was composed by James Newton Howard, was released on the opening day by the Hollywood Records label. Graham Hess (Mel Gibson), a former minister, lives with his asthmatic son Morgan (Rory Culkin), his daughter Bo (Abigail Breslin), who leaves glasses of water around the house for various reasons, and his younger brother Merrill (Joaquin Phoenix), a failed minor league baseball player, on an isolated farm in Doylestown, Pennsylvania. Hess has lost his faith and given up his priesthood after his wife, Colleen, died in a traffic accident caused by a town local, Ray Reddy (Shyamalan). One morning, Graham discovers a crop circle in his field. While investigating the crop circle with the local law enforcement, Graham learns of animals becoming violent across town. Morgan is forced to kill one of the family dogs when it turns violent against Bo. They hear reports of crop circles appearing all around the globe, and of lights from invisible objects over Mexico. Later, Graham and Merrill find the farm is being watched by a tall dark figure who disappears into the fields when they give chase. The next day, they hear strange noises over a baby monitor, but cannot find their source. Graham approaches the crop circle but on seeing a green leg sticking out of the cornrows, flees back to the house. After opening up to Merrill about the death of his wife, noting that her last words were "tell Merrill to swing away", Graham goes to visit Ray, the first time since the incident. When Graham is gone, Merrill and the children watch a news report about footage taken of an alien creature in Brazil, showing that the aliens can blend into their surroundings. Merrill joins the children in wearing tin foil hats, believing that the aliens can read their minds. At Ray's, Graham finds Ray is bleeding from an injury but otherwise apologetic for the accident. After Graham accepts his apology, Ray departs for a nearby lake, saying "they" do not like water. Graham finds that Ray has trapped one of the aliens in his pantry, and he tries to see what the alien looks like using a kitchen knife under the door; the alien grabs at him, and Graham reacts by cutting off its fingers with the knife before fleeing. On his return, and hearing news that more lights have been seen in the skies across the globe, the Hess family decides to stay at their house instead of leaving for the lake, barricading the doors and windows. After an emotionally charged dinner, they hear the same noises on the baby monitor before their television signal drops out, and place the final barricades and defenses before they gather together. When the aliens begin trying to gain entry into the house, the family discovers they have left the attic door unguarded and quickly retreat into the basement. The aliens assault the basement door and in the subsequent chaos the light goes out as Graham and Merrill prevent their entry. However, Morgan suffers an asthma attack when the aliens attempt to enter by way of an old coal chute. By morning, reports on the radio reveal that the aliens have left Earth as suddenly as they arrived. Graham leaves the basement to locate Morgan's asthma inhaler, the others following him. But they discover that an alien, the one trapped in Ray's home, is still there, and takes Morgan hostage. Colleen's last words come back to Graham, and he instructs Merrill to "swing away" with a baseball bat from his minor league days. Merrill attacks the alien but not before it attempts to poison Morgan by spraying him with a toxin from its body. Graham recovers his son when the alien drops him while Merrill continues to attack the alien, causing it to fall onto the ground, knocking over one of the glasses of water Bo had left and splashing it with water. The family sees that water reacts like acid on its skin, making it scream in agony, and Merrill begins knocking it into furniture, intentionally where Bo left water, and it is doused with water full on its face, and dies. Meanwhile, Graham takes Morgan outside with his medication and administers it to Morgan, and waits for his son to wake up, hoping that due to his lungs being closed from his previous asthma attack he was spared. Then, Morgan wakes up and the family rejoices. Some time later, the Hess family has recovered from the incident and they appear to be doing much better than before. In the final scene, Graham is shown returning to his priestly duties, apparently having regained his faith. Signs was filmed in 2001. The location of the film is credited as "Bucks County, PA" in the film. All scenes shot on location were actually filmed in Bucks County, Pennsylvania. Production shot all scenes of the house and cornfield inside the campus of Delaware Valley University, an agricultural college, where they had 40 acres of land to use. Production filmed the scenes in the bookstore and the pizza shop in Newtown, Pennsylvania. Production shot the pharmacy scene in Morrisville, Pennsylvania. All music was composed by James Newton Howard. The score was conducted by Pete Anthony and performed by the Hollywood Studio Symphony. With Signs, composer James Newton Howard again joins director M. Night Shyamalan for their third collaboration following The Sixth Sense and Unbreakable, and clearly the film presents another thrilling encounter with the supernatural. From his opening "Main Theme," Howard ratchets up the tension, and his music thereafter alternates only between the ominous and the suspenseful. He overloads his lower tones, employing eight basses, five percussionists, and even a tuba, but also uses a large string section for short, fast, repetitive figures meant to keep viewers on the edges of their seats. This is not particularly imaginative music, just good old Saturday afternoon scary movie fare, the only distinguishing characteristic about it -- consistent with Shyamalan's style -- that it is so relentless. There's just no let up; dread pervades every moment of the director's films, to the point of emotional exhaustion for some, and the score has to have the same uncompromising approach, which can make it a little hard to take when listened to all the way through. Signs has received positive reviews from film critics. Rotten Tomatoes reported that 73% gave positive appraisals based on 231 reviews, with an average rating of 6.8/10. The site's critical consensus reads, "With Signs, Shyamalan proves once again an expert at building suspense and giving audiences the chills." At Metacritic, which assigns a normalized rating out of 100 to reviews from mainstream critics, the film scored a 59 based on 36 reviews, indicating "mixed or average reviews". 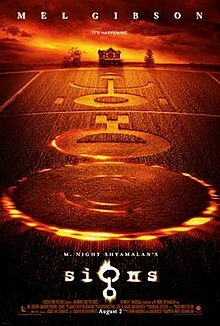 Roger Ebert gave the film four stars, writing "M. Night Shyamalan's Signs is the work of a born filmmaker, able to summon apprehension out of thin air. When it is over, we think not how little has been decided, but how much has been experienced ... At the end of the film, I had to smile, recognizing how Shyamalan has essentially ditched a payoff. He knows, as we all sense, that payoffs have grown boring." Nell Minow of Common Sense Media gave the film four out of five stars; she highly praised the casting and Shyamalan's direction, saying his "only flaw was not leaving anything to the audience's imagination". Mike LaSalle of the San Francisco Chronicle gave the film one star out of four, thinking that the film had "few thoughts and no thrills." Variety's Todd McCarthy criticised the film for its lack of originality, writing "After the overwrought Unbreakable and now the meager Signs, it's fair to speculate whether Shyamalan's persistence in replicating the otherworldly formula of The Sixth Sense might not be a futile and self-defeating exercise." In 2004, the film was listed as No. 77 on Bravo's The 100 Scariest Movie Moments for the Brazilian birthday party scene. Signs grossed $227,966,634 domestically and $180,281,283 internationally, which would total up to $408,247,917 worldwide at the box office, ranking only behind The Sixth Sense in Shyamalan's box office success and grossing more than The Village and Split. Signs was released on VHS and DVD on January 7, 2003. Flashbacks 1 and 2: Two scenes with Graham's wife, Colleen. In the first, she sits with a toddler Morgan and baby Bo in a rocking chair while Graham watches. In the second, she dances with him. She hums the same tune in both scenes. The dead bird: With no sound, this scene shows Graham going back home from Ray's, and after a short time, a dead bird near the road (after supposedly hitting an invisible forcefield) is shown. The attic door and the third story: The longest one, it starts with Merrill finding out about the not-boarded attic door. Despite Graham's efforts to call him back, Merrill goes up the stairs and manages to hold the door by climbing up a chair and putting his hands at the door. Trying to help, Graham looks for a way to hold the door. He gets a tall shelf and places it under the door. Knowing this is only a temporary solution, Graham gets his family and takes them to the kitchen and puts some chairs at the door to hold the aliens out of the room. There, he tells the "third story", about Merrill, in which he dislocated his arm. While Graham is telling the story, the shelf is destroyed from the attic door slamming on top of it repeatedly and the aliens gain access to the house. Everyone goes down to the basement, the only safe room available, as the aliens begin forcing the kitchen door open. ^ a b "Signs (2002)". Rotten Tomatoes. Fandango. Retrieved July 12, 2018. ^ "Signs (2002) - Financial Information". The Numbers. Retrieved August 23, 2017. ^ Kennedy, Colin (December 9, 2015). "Signs Review". Empire. Retrieved August 23, 2017. ^ a b c "Signs (2002)". Box Office Mojo. Retrieved February 1, 2011. ^ Shyamalan, M. Night (Director). (2002). Signs [Motion picture]. United States: Touchstone Pictures. ^ Elijah, Andy (July 17, 2018). "Signs was the re-assuring escapism we needed after 9/11". cinedelphia.com. Retrieved August 5, 2018. ^ "Bucks County, Pennsylvania, Film Office". www.visitbuckscounty.com. Retrieved September 23, 2017. ^ Bloody Disgusting Staff (May 3, 2010). "10 of the Most Underrated Horror Scores!". Bloody Disgusting. Retrieved March 26, 2019. ^ Ruhlmann, William. James Newton Howard: Signs [Original Motion Picture Score] at AllMusic. Retrieved 1 March 2012. ^ "Signs Reviews". Metacritic. CBS Interactive. Retrieved May 5, 2010. ^ Ebert, Roger (August 2, 2002). "Signs Movie Review & Film Summary (2002)". Chicago Sun-Times. Retrieved February 21, 2011. ^ Minow, Nell (May 18, 2003). "Signs - Movie Review". Common Sense Media. Retrieved November 15, 2012. ^ Lasalle, Mick (August 2, 2002). "'Signs' of distress / Shyamalan's puzzling plot circles go flat quickly". San Francisco Chronicle. Retrieved March 26, 2019. ^ McCarthy, Todd (July 29, 2002). "Signs Movie Review". Variety. Retrieved February 21, 2011.